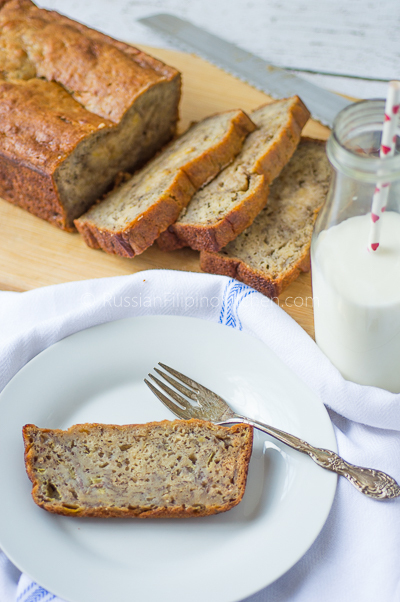 When it comes to banana bread, I like mine soft, moist, and dense, with a glass of milk. Not dry and flaky. I’ve tried a couple of banana bread over the years that are equally good but lacking the moist and dense qualities I prefer. This favorite recipe achieves that. Just one slice is enough to make one satiated. 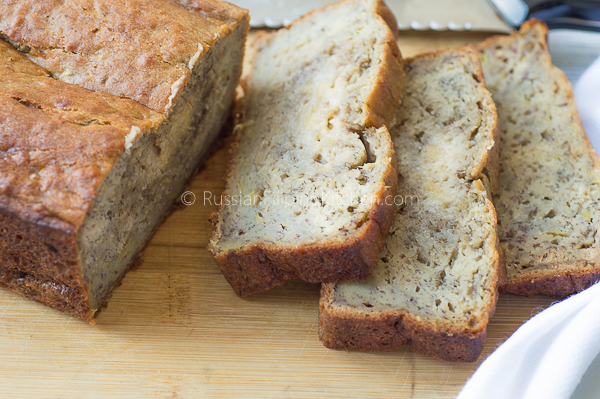 If you are looking for a classic banana bread that’s super easy and yields a loaf of the best banana bread you’ll ever have. The most important things to remember is to use overripe bananas and to make sure to stir the batter just enough to moisten. 1. Preheat oven to 350º F. Lightly grease a 9” x 5” loaf pan. 2. Combine all dry ingredients and set aside. 3. Cream together butter and brown sugar. 4. Stir in eggs and mashed bananas till well-blended. 5. Stir flour mixture into banana mixture. Add the nuts then stir just to moisten. 6. Pour batter into loaf pan and bake for 60-65 minutes or till toothpick comes out clean. Preheat oven to 350º F. Lightly grease a 9” x 5” loaf pan. Stir in eggs and mashed bananas till well-blended. Stir flour mixture into banana mixture. Add the nuts then stir just to moisten. Pour batter into loaf pan and bake for 60-65 minutes or till toothpick comes out clean. Thank you for sharing your recipe! This is perfection! I only have 2 pcs overriped banana so I cut the recipe in half and cook it for 30 mins. This is the best one I’ve found. Pinned and saved it. You’re welcome, Jona! Thanks for leaving your feedback! HOLY COW is this bread delicious!! By FAR the best recipe I have come across! I have a habit of trying new recipes for different things, but I will NOT wander from this one! Permanent fixture in my recipe box for sure!! Thank you so much for sharing this!! I have been searching for the perfect banana bread recipe for 25 years. This is IT. Thank you for sharing your recipe! Its GOLD.